On the line of Tata Docomo’s Daily Plans, India’s 2nd largest GSM Mobile service operator Vodafone Essar has joined the bandwagon of similar plans specially tailored for short term needs. Vodafone today announced its Daily Plans dubbed as “Try before you buy-Bonus Recharge” for its GSM Prepaid Mobile subscriber in Chennai and Tamil Nadu telecom circle.These all new recharges which is specially designed to provide more flexibility over prepaid tariff and also aims to cater every one with their own needs. 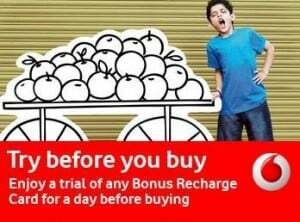 Under the “Try before you buy Bonus Recharge” range, Vodafone introduces four bonus coupons priced at Rs.4 each with various benefits like Free SMS, Reduce Call charges, GPRS etc. These can be easily activated through USSD. All Other Local & STD Calls at 50p/minute.